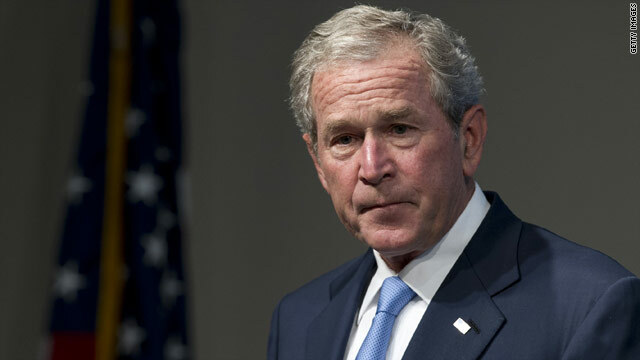 Washington (CNN) - More than three years after leaving office, former President George W. Bush remains unpopular with the public, according to a new national poll. A CNN/ORC International poll also indicates that two-thirds of Americans have a positive view of Bush's predecessor, former President Bill Clinton. According to the poll, released Thursday morning, 43% of people questioned had a favorable opinion of Bush, with 54% saying they had an unfavorable view of the former president. Bush's 43% favorable rating is the same as it was in 2010 in CNN polling, but is up from his mid-30's favorable rating during 2009, his first year out of the White House. "Don't be surprised if the Obama campaign mentions the name of George W. Bush at every opportunity, and don't be surprised if that strategy works," says CNN Polling Director Keating Holland. "And the mention of Bush's name appears to prompt at least a few people to take a more positive view of their current financial situation." When asked in the survey whether they are better or worse off than they were four years ago, Americans are split, 44% to 43%. But when asked whether they are better or worse off than they were four years ago "when Bush was president," a small gap opens - 47% say they are better off compared to 41% who say they are worse off. The poll suggests that any attempts by Republicans to respond to the highlighting of Bush by stirring memories of former President Jimmy Carter may not work. Carter, the one-term Democratic president who was election in 1976 and defeated in 1980, is viewed favorably by 54% of the public, with just three in ten seeing him in a negative light. Bush's father, George H.W. Bush, gets a 59% rating, with 34% saying they have an unfavorable view of the first President Bush, who was elected to the White House in 1988. Bush was defeated in his bid for a second term by Bill Clinton, who has a 66% favorable rating in the poll. Only 31% say they hold an unfavorable rating of Clinton. The former two-term Democratic president's favorable rating bottomed out in CNN polling at 51% in June of 2008, after Clinton took a very active role in advocating for his wife, then Sen. Hillary Clinton of New York, in her historic battle with Sen. Barack Obama for the Democratic presidential nomination. The poll's release comes as the former president holds his second Clinton Global Initiative America conference, in Chicago. Clinton is expected to speak with CNN's Wolf Blitzer. The interview is expected to run on CNN's The Situation Room with Wolf Blitzer at 4pm ET. The CNN poll was conducted by ORC International, with 1,009 adult Americans questioned by telephone from May 29-31. The survey's overall sampling error is plus or minus three percentage points. Looking back at Bill Clinton's presidency now, it seems like a golden age of peace and prosperity. Yet for 16 years – the 8 years that he was president, followed by the 8 years Bush was president – Republicans declared Clinton the worst president in history and that he single-handedly was destroying the county. (Sound familiar?) The right blamed Clinton for every single that went wrong both during and after his presidency. Fox News was literally still blaming Clinton the night before Obama's inauguration. Then the next day, they immediately started blaming Obama for the entire mess that was left to him by Bush. The worst president in entire USA History. And how is this article news worthy, no one cares about Bush that is old history. It's all on how you ask the questions. Polls can say anything you want them to say, if you know how to manipulate them. Wow! 43% is incredibly high, considering the damage this troglodyte and his henchmen Cheney, Rumsfeld, etc.wreaked.